NEW! 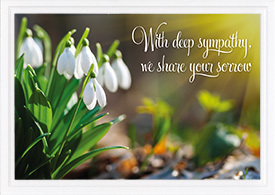 FRONT: With deep sympathy, we share your sorrow INSIDE: "Jesus said to her: 'I am the resurrection and the life. 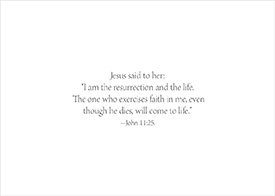 The one who exercises faith in me, even though he dies, will come to life. '"-John 11:25. An attractive embossed white border nicely frames the high-gloss UV coated picture on the front. Size: 5" x 7" folded.